Why April 6th? Why Gold & Denim? Bohring-Opitz Syndrome Awareness Day takes place on April 6th each year. Taylor Gurganus, co-founder of the BOS Foundation, organized the first BOS Awareness Day on April 6, 2015. April 6th was selected for BOS Awareness Day because it is the anniversary of the formation of the first BOS Support Group on Facebook. This Support Group allows parents and caretakers of those living with this rare syndrome to communicate with someone who relates to their triumphs and challenges. Parents from The Support Group selected the color gold to represent BOS Awareness because most children with BOS like shiny, bright objects. They selected denim (jeans) because it represents rare diseases. 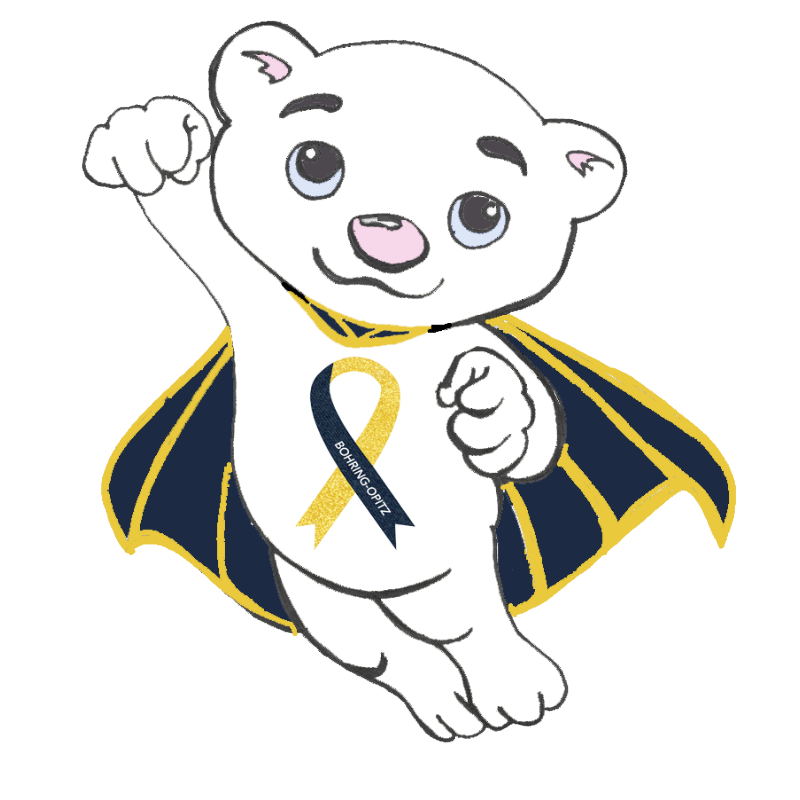 Taylor had a gold and denim ribbon created to promote BOS Awareness, and it continues to be a symbol of support and hope for those affected by Bohring-Opitz Syndrome. Following in the spirit of the originators of BOS Awareness Day, the BOS Foundation is building the awareness movement to help those living with Bohring-Opitz Syndrome. Here are some ways you can participate in BOS Awareness Day in your area! •What does Bohring-Opitz Syndrome mean to you? Submit your video clip answering that question or email your response to taylor@bos-foundation.org. The BOS Foundation will be creating a video to raise awareness. •Make reservations for a party at a local restaurant or your home and invite all your friends to join. Don’t forget to wear your denim and gold, and pass out BOS Awareness ribbons, coloring sheets, and flyers! •Visit children’s hospitals and pass out Bohring-Opitz Syndrome flyers. Ask staff to post them around the hospital or leave them in waiting rooms. •Distribute coloring sheets to your local schools, restaurants, doctor offices, etc. to educate families about Bohring-Opitz Syndrome! Special thanks to Wyatt Davis’ Uncle Cragg McFarlin for helping with the coloring sheets! • On social media, share, share, and share information about Bohring-Opitz Syndrome! Ask your friends, families, and community to take a photo with our We Are Stronger Together flyer. Use the hashtag #BOSStrongerTogether and #BOSaware. •Join our BOS Awareness Day Facebook Event! The BOS Foundation would love to support your efforts by sending you BOS key features document and awareness baggies. Please contact taylor@bos-foundation.org to request these items, and thank you for playing an important role in raising awareness. Families around the world are helping raise awareness! Read their stories below. With BOS Awareness Day falling on a Saturday this year, we decided to celebrate with a "Meet Hazel" event at Grandma's house. We sent out Facebook invitations, handed out flyers to friends and neighbors, and invited by word of mouth. This meeting was for me to introduce London to Justin and tell him our story. He is now BOS aware. I am so passionate about spreading awareness because people cannot be compassionate, become involved, or work on a solution to a problem they do not know even exists. I have recently created a group of new work representing the new now. Another big challenge is in front of us. Her scoliosis is growing to the degree where I need to decide if it should be fused. The doctors actually leave that up to me, her parent. What will be her quality of life? What will it be with or without it? That decision is overwhelming me. It has become the impetus of these four works. We realize a lot of BOS families do not have help so we wanted to raise funds to support them. Our first fundraiser, Blocks for BOS, came about because at the time there had been 150 kids diagnosed with BOS. . We wanted to honor all 150 children and we walked 150 blocks and pushed Mia in her wheelchair.